I tweeted the above as I was making my way through Disneyland actually using the MaxPass system. The tweet came from my own emotional response to the new Disneyland system after using the WDW FastPass+ system for a long time now. And I really liked what I was seeing at Disneyland. 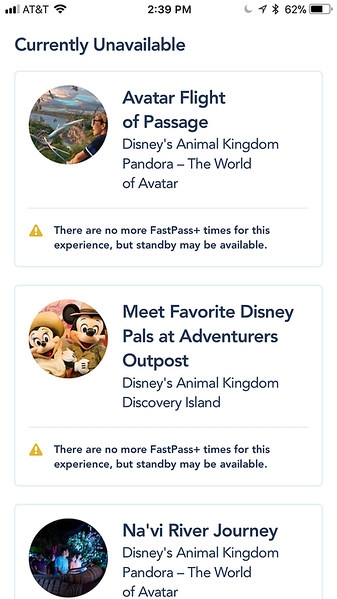 One of the problems with Walt Disney World’s FastPass+ (FP+) system is that it’s a pain to figure out what’s going on with FP+ availability as the day goes on. You start with your initial three reservations, and you know you should be able to get a fourth reservation once you’ve used the first three, but without going through the initial motions of CHANGING an existing reservation, you’re left in the dark as to what’s available until AFTER you’ve used those first three. What’s the FastPass availability at Disneyland? Open the app and find out. Not so easy at Walt Disney World. Contrast this with Disneyland’s system, where you can simply pull up a specific attraction on the Disneyland app to see if FastPass is still available, as shown in the image above. 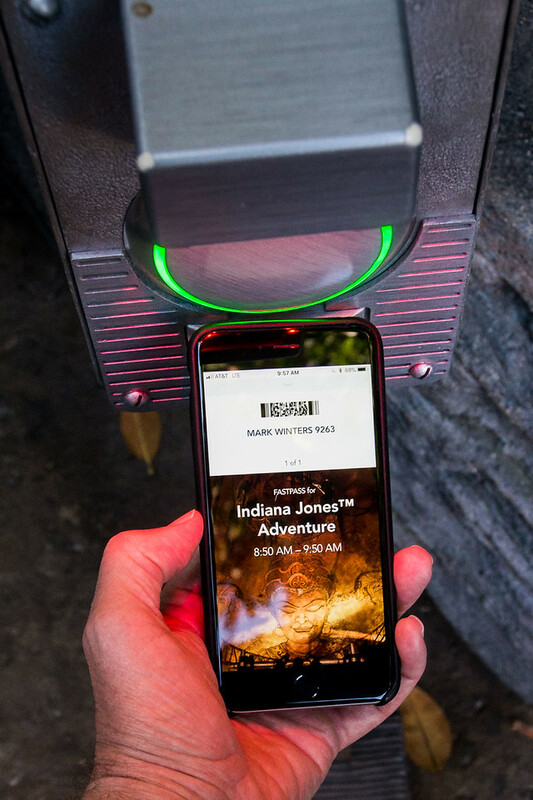 Better yet, with Disneyland’s system you can see WHEN FastPass tickets are being distributed for. This allows you to judge how close they are to “selling out” for the day. 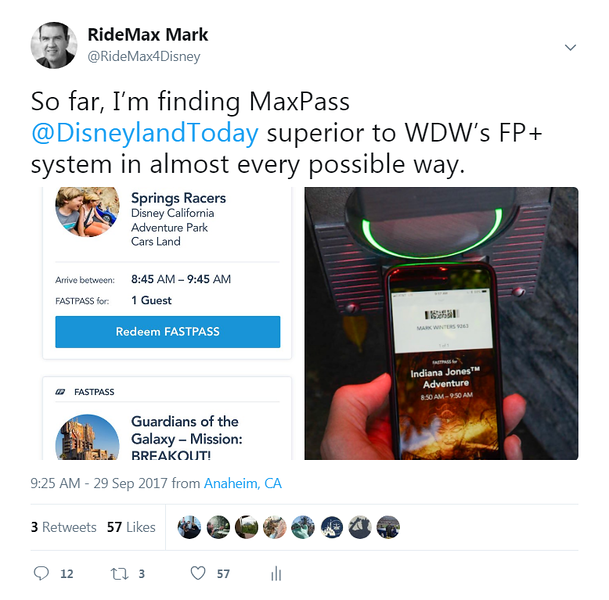 If I’m using RideMax to map out a game plan for Disneyland, either using MaxPass or the traditional FastPass system, I can literally create my RideMax plan as I’m walking from my hotel to the park first thing in the morning. Even though I’m creating my RideMax plan the morning of my actual visit, I’ll be on equal footing with the person who created their plan a week or even a month earlier. Want to skip the lines without making reservations weeks in advance? Disneyland’s MaxPass/FastPass system allows for this. Contrast this with the Disney World FastPass+ system, where if you haven’t secured your FP+ reservations several weeks in advance, you’re putting yourself at a huge disadvantage compared with those who have, since FP+ reservations are distributed on a first-come, first-served basis. I still remember when some of Liesle’s extended family came to town for a once-in-a-lifetime trip to Walt Disney World, but who weren’t aware of the new (at the time) FP+ system. They were actually in the park before they realized they needed to make those FP+ reservations. But guess what? By that time, it was too late to get reservations for some of the more choice time slots, and for some attractions, it was too late to get FP+ reservations at all. So here they were, spending thousands of dollars on this trip, only to be sabotaged for their entire vacation because they didn’t look into this one detail several weeks before leaving home. Contrast this with Disneyland, where even if someone doesn’t know anything about FastPass or MaxPass before arriving for their vacation, they can figure out the system within the first few hours of their visit, and then take full advantage of it for the rest of their trip. At Disney World, these people are simply out of luck. Even if they figure out the new system quickly after arriving, many FP+ time slots are simply not available by then. In my opinion, trying to deal with FastPass reservations for a large group is where Disneyland’s system shines, and Walt Disney World’s system simply falls apart (it’s just terrible)! You can click on the image above for a larger view, but this shows just a sample of the FastPass situation we were dealing with on that trip. It’s hard to see all of the tickets, but I think I count 37 FastPasses for Radiator Springs Racers, all falling within five minutes of each other. Although getting all of these FastPasses was a minor hassle (and this would still be true with the new MaxPass system), if I were trying to do this at Walt Disney World, it would be WAAAY more difficult, if not impossible. 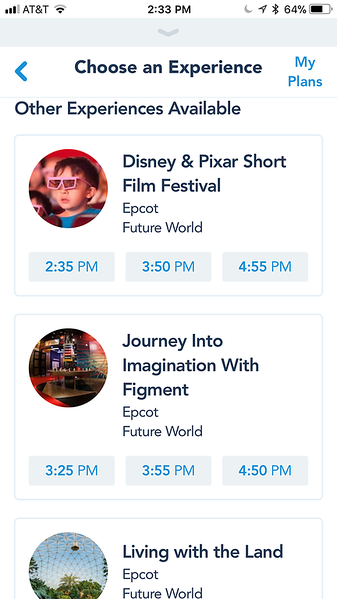 One problem with groups under Disney World’s FP+ system is that the larger the group, the more difficult it is to find an available time slot. So while I might find many available reservation times for a party of one or two, I’d find a lot fewer slots available for a party of eight or ten, let alone 37! Plus, I can’t even imagine how I would make this work in the “real world” under WDW’s FP+ system. Do I link all 45 park admission tickets to the same account? Is this even possible? It doesn’t really seem practical… I think each family in our group would probably have preferred to manage their own individual account and associated tickets, but that leads to another problem. Under Disney World’s system, trying to sync up FP+ reservations with a friend or with another group is very much hit-or-miss (I know because I’ve tried to do this more times than I can remember). If each family in our large group made their own reservations, it would be VERY hard to get all of those FP+ reservations to line up in the same one-hour window. AND THAT IS JUST FOR ONE ATTRACTION! Imagine trying to do this for three attractions per day, for 45 people, over the course of seven days! The Disneyland system, on the other hand, is simple by comparison. As long as all of us are in the park, once we agree on the attraction we all want to ride, each family just pulls out their phone. We are all presented with the same one-hour window for the given attraction. BAM! We’re done. No back and forth with the “That slot you have isn’t available for me, what about this one?” sort of thing you end up doing with the Disney World system. Over. And over. And over again. With as much money as Disney World stands to make on large groups like this, you’d think they’d make it more convenient to align those FP+ reservations. The Disneyland MaxPass system works fine for large groups. It’s a major pain at Walt Disney World. If my extended family wants to do another large-family Disney trip sometime soon, I’ll recommend we visit Disneyland. Trying to manage FP+ reservations for large groups at Disney World is just a huge hassle. Before you correct me on this one and tell me that FastPass+ is free, while MaxPass costs $10 a day, let me remind you that there are really two “tiers” of service available for each of these two systems. For Disneyland, the two tiers of service are that I can either use the traditional FastPass machines, which are free, or I can use MaxPass, which costs me $10 per-person, per-day (or $75 as an add-on to an annual pass as of this writing). For Walt Disney World, the two tiers of service are dependent on where I choose to sleep. If I’m staying in a Disney hotel, I can make my FP+ reservations up to 60 days in advance of my trip. If I’m not staying on-property, I can only make my FP+ reservations up to 30 days in advance of my trip. And that extra 30-day advance booking benefit you get from being a Disney hotel guest makes a huge difference for Walt Disney World visitors. It easily marks the difference between the ability to make FP+ reservations for very popular attractions (Seven Dwarfs Mine Train, Avatar Flight of Passage) and not. One simple fact of theme park operations is that rides will break down unexpectedly due to technical difficulties. The big question for this discussion is, will Disneyland’s or Walt Disney World’s system handle the closure better? I should mention here that in case of a ride breakdown during a either reserved MaxPass time slot OR a FastPass+ time slot, Disney will offer the guest a “use anytime” pass which is valid for the rest of the day, and which may be used on either the attraction for which the reservation was originally intended, or on another attraction of the guest’s choosing. The list of choices doesn’t usually include ALL attractions in the park, but it normally includes at least the original attraction which was scheduled, plus several other attractions of the same “popularity level” or lower. But when a ride breaks down temporarily at Disneyland, the park will often help lower future FastPass redemptions by pushing the “return window” out to later in the day than usual. That way, when the ride eventually does come back up, demand for the FastPass queue won’t become totally crazy, as they’ve reduced the number of FastPass tickets issued. Contrast this with Walt Disney World, where most guests have made those FastPass+ reservations well in advance of their actual visit, and well before Disney knew that a particular ride would break down for several hours on a given date. 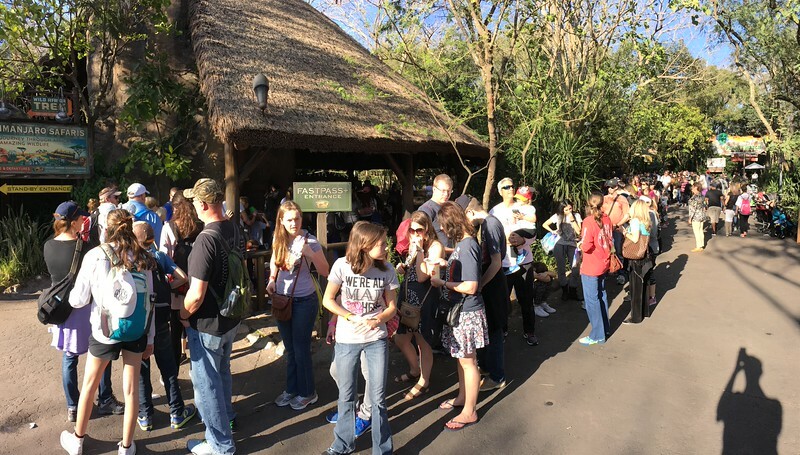 FastPass+ queue for Kilimanjaro Safaris. Can you even see where this line starts? Unlike at Disneyland, where the number of FastPass slots handed out are reduced because of the down time, the number of FastPass+ reservations handed out at Walt Disney World remain basically the same for a day when the ride breaks down versus a day when it doesn’t. And yes, guests may just “give up” and choose to ride something else with that reservation, but for those that don’t, that FastPass+ queue can get crazy as many of those who had a reservation during the downtime return once the attraction comes back up. With MaxPass (and Disneyland’s FastPass system in general), as long as two guests arrive at the same time of day, they’ll have equal access to all of the attractions which support FastPass. At Walt Disney World, unless I’ve paid extra for my lodging so that I have access to that 60-day advance booking window, I’m out of luck for the most popular attractions. Disney World’s system is much more “pay-to-play” than Disneyland’s is. 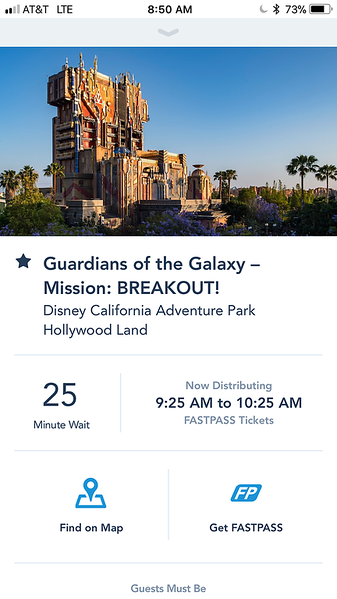 As I mentioned under #1 above, with Disneyland’s FastPass system, you can pull up the Disneyland app and see which FastPasses are still available as the day goes on. But since the FastPass distribution pattern for a given crowd level follows somewhat predictably from one day to the next, it’s easier to guess in advance which FastPasses might still be available at any given time of day. Contrast this with FastPass+ at Walt Disney World, where once you’ve finished your first three FastPass+ experiences, what’s available next as a fourth experience can depend a lot on simple luck. Did a party of similar size to mine just cancel their FastPass+ reservations a few seconds ago, opening up a slot that I can use? If so, that’s great and I can take advantage of it, but it’s hard to know in advance if that will happen or not. So ironically, for a system that seems to tout the peace of mind that comes from making your reservations 60 days in advance, on the actual day of your visit, you don’t know which attractions you’ll be able to secure reservations for as the day goes on, making it *more difficult* to plan your day in advance. Should I ride Big Thunder in the standby line early in the morning, or wait until later in the afternoon and hope a fourth FastPass+ slot is available then? Who knows? By the way, this is one reason the Walt Disney World version of RideMax doesn’t really deal with what *might* be available as a fourth FastPass+ slot later in the day. We’ll just treat any extra FastPass+ reservations we get beyond the original three as a bonus, and plan the day accordingly. Because Disney World offers FastPass+ reservations for its best attractions mostly to its own hotel guests, it had to do something for everyone else. That “something” turned out to be adding FastPass+ queues to attractions with HUGE hourly capacity, and which otherwise didn’t really need a FastPass option. PhilharMagic and Journey Into Imagination With Figment are examples of this. FastPass+ “opportunities” available for rides that don’t need it! The problem with adding FastPass+ to these attractions, however, is that it has lengthened the standby queues for some of them to the point where it’s now a pain to visit these attractions *without* FastPass+. This is for rides where the standby queue used to be just fine in most situations (think Pirates of the Caribbean here). 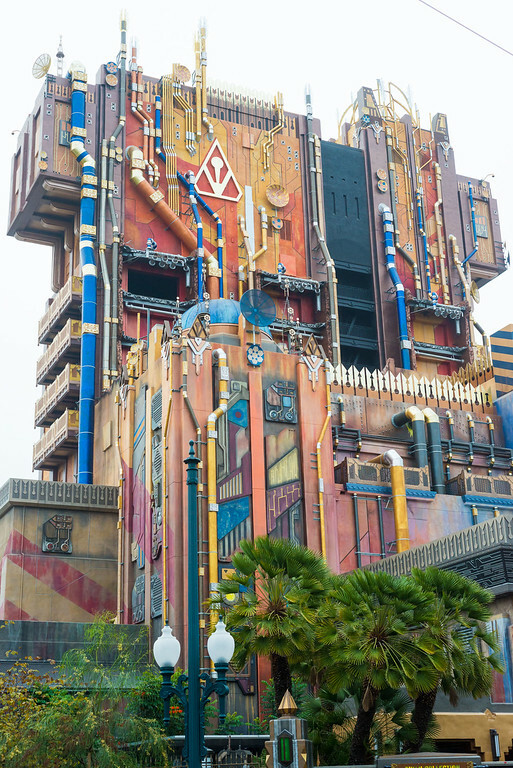 Want to visit Guardians of the Galaxy AND Radiator Springs Racers with FastPass? At Disneyland, it’s no tiers, and no problem! It’s probably no secret that Disney makes much more money per day from tourists who are visiting the park than they do from annual passholders who are just dropping in for a couple of hours. And yet, as a Walt Disney World annual passholder, even though I frequently can’t schedule some of the headliner attractions via FastPass+, I can often reserve a few decent rides as late as the early morning of my visit. This allows me to drop in to the Magic Kingdom for a couple of hours in the afternoon or evening and hit Big Thunder, Pirates, and Buzz Lightyear, for example, all using FastPass+. That’s great for me, but it comes at the expense of the higher-dollar tourist, who now has to wait in longer standby lines. In my mind, the high-dollar tourist is most likely to be the kind of person who is willing to hit the parks early in the day in order to get the most from their vacation dollars. And people who arrive early in the day are those who benefit the most from Disneyland’s MaxPass/FastPass system. On the other hand, the low-spending annual passholder who just drops in for three rides in the afternoon or evening is the one who benefits most from Disney World’s FastPass+ system, at least on a per-hour-in-the-park basis. There you go, the 10 reasons why I think MaxPass at Disneyland is better than the FastPass+ system at Walt Disney World. Before I close I want to mention something that may be the most telling in all of this, and that is the fact that if I had to choose between using Disneyland’s system without MaxPass (just using the regular FastPass machines) and Disney World’s system even with the hotel advance-booking benefit, I’d still come down in favor of Disneyland’s system. What do you think? Are there benefits to either system that you think I’ve missed? Please share in the comments below!